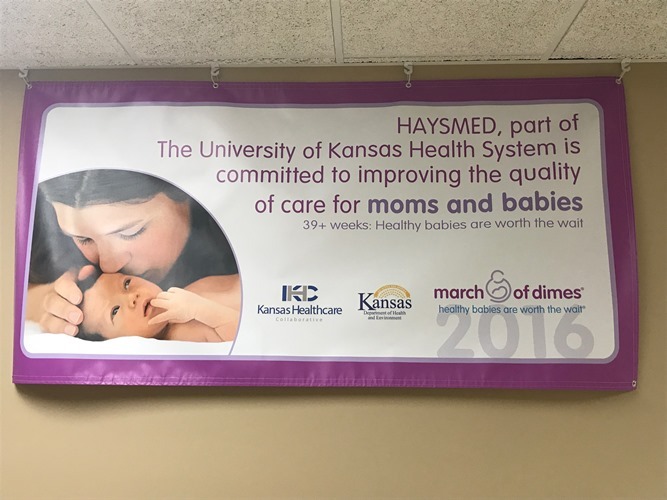 Hays, KS (July 7, 2017) HaysMed has reduced the number of elective inductions and cesarean deliveries performed before 39 completed weeks of pregnancy. This effort, encouraged and recognized by March of Dimes, gives more babies a healthy start in life. The Kansas Department of Health and Environment (KDHE) Bureau of Family Health, March of Dimes and the Kansas Healthcare Collaborative (KHC) have joined together to encourage continued progress towards eliminating early elective deliveries (EED) in Kansas. The collaborative efforts and hard work of hospitals have resulted in a rapid and significant reduction in the statewide EED rate from eight percent in 2013 to two percent in 2015. March of Dimes’ national Hospital Banner Recognition Program is designed to recognize hospitals that have achieved EED rates below five percent. “We’re proud of our expert team of physicians and nurses who recognized the problem of unnecessary early deliveries and put in place policies to avoid scheduling c-sections or inductions before 39 weeks of pregnancy, except when medically necessary,” said Terry Siek, MSN, RN, Chief Nursing Officer and Vice President for Patient Care at HaysMed. According to Lisa Brening, MSN, RN, HaysMed OB/NICU Clinical Supervisor there is a general misconception amongst the public that if you are term, your baby must be perfectly ready to be born and handle life on his or her own. “This laudable achievement deserves recognition, and KDHE is proud to supply banners at no cost to qualifying hospitals,” said Susan Mosier, KDHE Secretary and State Health Officer. Babies born before 37 weeks of pregnancy are considered premature. Even babies born just a few weeks too soon can face serious health challenges and are at risk for lifelong disabilities including breathing problems, vision loss, cerebral palsy and intellectual delays. In the United State, about 380,000 babies are born too soon each year- that’s 1 in 10. “March of Dimes knows that Healthy Babies are Worth the Wait,” said Kansas Market Executive Director Kenneth Jackson. “This campaign urges women with a healthy pregnancy to wait for labor to begin on its own, rather than scheduling delivery before 39 weeks,” he added. March of Dimes offers both professional and consumer education materials about the critical importance of a full-term pregnancy to the health and well-being of babies.